Names are often a tad misleading. This is definitely the case with the axolotl, which is often referred to as the “Mexican walking fish.” First, this little guy is not a fish; rather, he’s a neotenic salamander (a kind of amphibian). Neotenic salamanders are generally characterized by a lizard-like appearance, with thin bodies and somewhat stumpy legs. Additionally, some members of this group don’t have any hind legs. 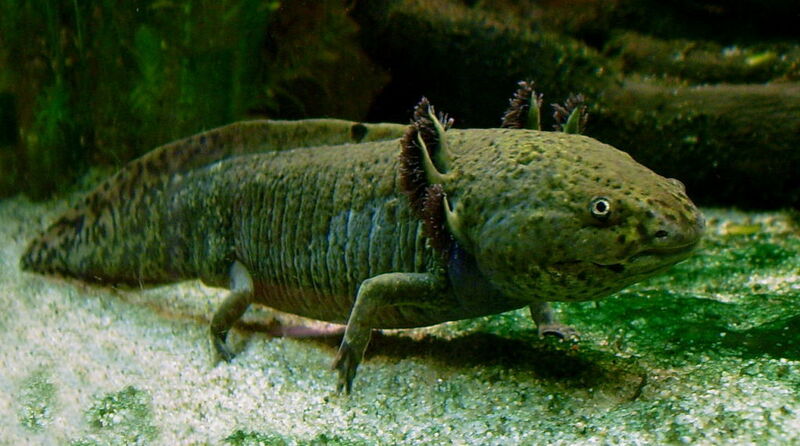 And saying that the axolotl “walks” is also a tad off base. Unlike most amphibians, which undergo metamorphosis (a process in which they develop lungs and legs and take to land), the axolotl keeps its gills and remains an aquatic creature throughout its life. The axolotl has been heralded by many as the most adorable creature on planet Earth. However, there are some members of the population that are slightly less…adorable…by human standards. If you are looking to adopt one of your own, as the name indicates, you will need to head to Mexico, as they are most often found in the lakes surrounding Mexico City. Is Mexico City too far away for you to travel? Don’t be too upset. Even if you did travel to Mexico, the chances of you finding an axolotl are exceedingly slim. In January of 2014, a team led by biologist Armando Tovar Garza of Mexico’s National Autonomous University stated that the creature “is in serious risk of disappearing” from the wild. Between 2005 and 2009, there was a 90% decline in the population, and when describing a 2013 effort by researchers in skiffs to try to net axolotls in Lake Xochimilco, Tovar Garza summed up the results as “four months of sampling — zero axolotls.” However, a subsequent study in February of 2014 found two axolotls; however, the team was unable to net the organisms. This species is known only from central Mexico, on the southern edge of Mexico City, in canals and wetlands in the general vicinity of Xochimilco (including outside the Xochimilco city limits, around the Chalco wetland). It was originally found in Lakes Xochimilco and Chalco (and presumably in the connecting lakes Texcoco and Zumpango), but it has disappeared from most of its range…. A recent scientific survey revealed no axolotls, although wild-caught animals are still found in the local market, which indicates that fishermen still know where to find them. There has not been a density study of the Chalco population, but evidence suggests that the population there is small and, furthermore, Chalco is a highly unstable system that runs the risk of disappearing in the near future. If you are serious about going to find one in the wild—Don’t. Though there is a local illegal trade in the animals (for human consumption, medicinal uses, and use as pets) there is no valid reason to take one of these creatures from their natural habitat. Doing so is not only illegal, it is ethically unjustifiable from an ecological perspective. That said, due to the tiny population size, it is assumed that all international trade is now in captive-bred animals.